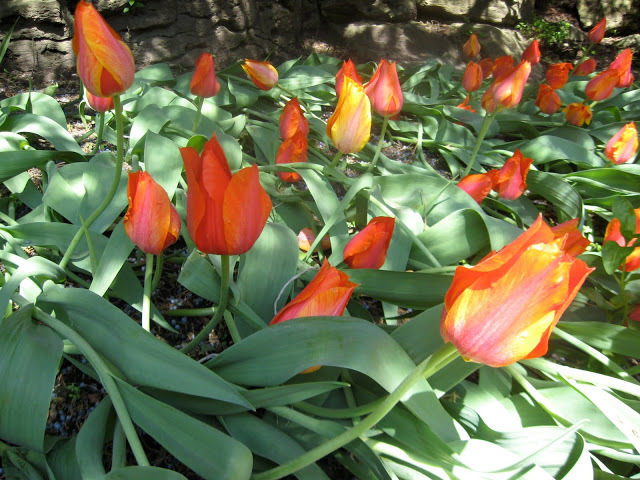 This single, late tulip, “El Nino” positively glows in the sun. • My city garden is hard as heck to dig. I have tree roots I must sever through, making digging in my garden at any time a miserably arduous experience. My country garden, on the other hand, is chock full of rocks, sometimes I encounter giant boulders I can’t do anything about. • Squirrels sometimes dig up the tulip and crocus bulbs, which is heartbreaking/annoying. • The expense. It’s hard to justify shelling out for tulip bulbs when they might become high priced squirrel food. Bulbs aren’t super cheap at any time. 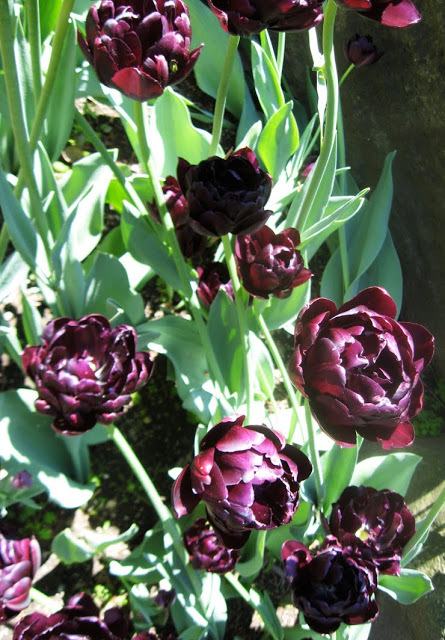 Enchanting, dark, double, late tulip “Black Hero”. • It’s frighteningly easy to forget where you’ve planted bulbs. I can’t remember where the tulips that are already in the garden are planted, so I worry I may spear one if I start to dig. With all these reasons NOT to plant bulbs, why do I have the urge to plant bulbs this year? I am an impatient gardener, and bulbs are not for the impatient. Impatient gardeners have enough problems putting out bedding plants from 6 packs, (which always look a bit mingy when you first plant them), but they do fill out, and there’s something there that you can see. Bulbs, on the other hand are buried completely. They are underground, mysteriously sprouting and growing roots. At least that’s what we are told. We have to believe it’s true. If we’re lucky we have a wonderful surprise in the spring, a reward for our act of faith. 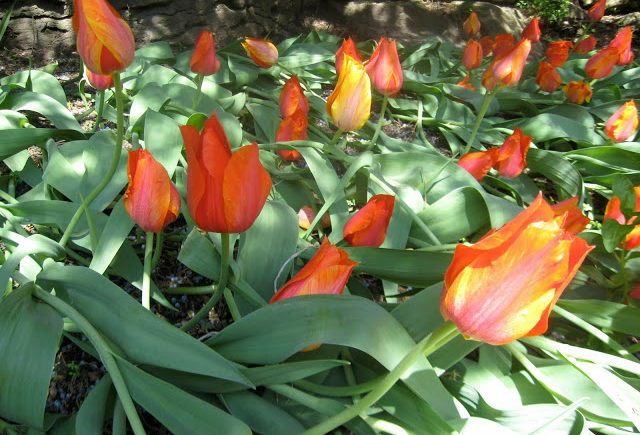 Lily flowered tulips—one of my faves—this one is “Jazz”. Flower bulbs are all about delayed gratification—the faith that one day this little dried looking pointy thing will become an exquisite flower. It’s hard to be patient about delayed gratification of joy. Planting bulbs is commitment, a leap of faith. What’s more, let’s point out the really awful truth here: when you plant a bulb you have no guarantee you’re even going to be around to see it bloom in spring. Anything could happen between now and then. I’m old enough now to know how true this is. When you plant a tree you exercise the same act of faith. You likely aren’t going to see the tree in its maturity, (unless you spent a good deal of your childhood planting trees, not a bad idea, actually. Get out there, kids!) But you plant the tree in spite of that. It’s the same with bulbs. You plant, and have faith you will see the flowers. Bulbs do bring guaranteed joy, in time. It works that way. That’s why I really must plant them this year. It’s a little gift to the future: a gift to myself, to my neighbours. And to a few squirrels. My reluctance I blame totally on squirrels. My first act as a new gardener was to purchase and lovingly plant 60 crocus bulbs, that were then effectively dug up and replanted all over the neighborhood (the nerve!) by crafty squirrels. Thank you for the smiles today as I read your post! I have had success in keeping away squirrels by planting bulbs deeper than recommended and by sprinkling them with chili powder before covering them with earth once they are in the ground. I share your concern about their cost. No tulip is worth more than 50 cents yet they are priced at almost double that amount. One words. Pots? But we don't have squirrels, we have moles. The reward is so worth it! That tiny tree will someday be mighty! The pride that comes from those years of growth is immeasurable. I posted about a tree today that I planted when it was 2 inches tall. It's only been a year since it went into ground, but it's already a foot and a half! I look forward to watching it grow! Planting in my rock hard garden soil is a pain! But, I do love them each spring. OMG, I just remembered I ordered a 1000 Tommies! I am hoping fall rains will make the soil easier to work with~who am I kidding! I've always lived in rental apartments, moving year to year, so planting bulbs seemed silly when I wouldn't be there to see them the next year. This year I've decided to plant them and forget about them, leaving them as a gift for the next tenant, which also relieves the temptation to concern myself with where, when and how they'll come up! I appreciate this post. That there are bulbs 'under there' gives me a little jolt of anticipation every time I look at the bed where they lurk. I'm a new convert to tulips and planted them for the first time last year. I was stunned by some wonderful bright yellow, multi-petalled ones in the late spring. I wouldn't even have known they were tulips if it hadn't been for the packet! There's a bare patch above them at present. Annuals are over and I can't dig down for fear of damaging the bulbs. I'm wondering whether to shallow plant crocuses . . . but even then, the earth itself will be bare. Plant bulbs in the fall and cover with rocks or bricks. When the spring comes, they will have sufficient roots to keep from getting dug up. Squirrels don't like to work hard, so they only dig up freshly planted. Put rocks on anything you plant to deter squirrels. I just keep some rocks in the garden and use them when necessary. Decent size too. Squirrels will move small rocks. 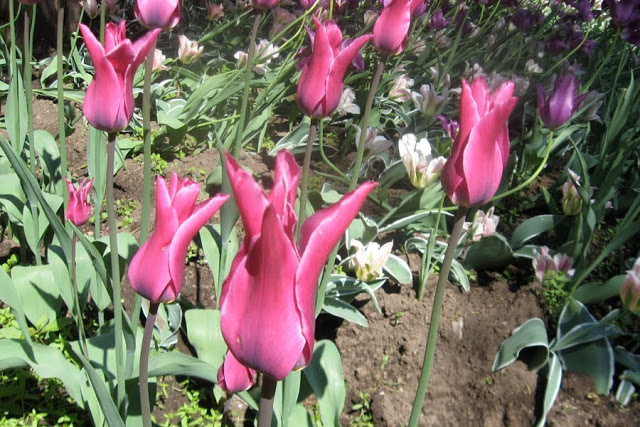 On the tulip heads – when green, put vaseline. Deters squirrels from nipping the heads before they flower.